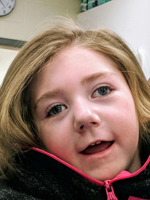 Jordan Leigh Powell was born May 9, 2013 at Riverside Hospital in Newport News, VA. After a long, courageous battle with Cerebral Palsy and Epilepsy, this beautiful Angel left her house here on earth when Jesus called her home on March 22, 2019. Anyone who knew Jordan, knew she was a joy to be around. Her blue eyes lit up like the ocean. Her smile shined brighter than the sun, especially when she heard her favorite show The Bubble Guppies. She enjoyed riding the bus to school. The bus attendants warmly greeted her each morning and afternoon. Jordan loved coming to school. She loved being around her friends and her Kiln Creek Elementary school family. Jordan was affectionately called Princess Jordan at school. Princess Jordan had such a warm heart. She loved attention. She loved to sit on the school staff’s lap and do exercises. Princess Jordan’s eyes would sparkle at the staff members she was working with. She enjoyed laughing and engaging with her classmates. Now she is running, dancing, singing and playing in the sight of Jesus. What a sweet thought it is, to know we will see her again. Jordan Powell is survived by her mother, Christina Bramlett and fiancé, Jason Allen Powell; her father, Jason Lee Powell; grandparents, Peggy and Donald Bramlett and Judy and Archie Powell. The family will receive friends on Saturday March 30, 2019 at 10:00am at Emmaus Baptist Church, 814 Yorktown Rd, Poquoson, VA 23662 with a Memorial Service to follow at 11:00am. A GoFundMe page has been set up to help the family with funeral expenses. www.gofundme.com/donations-for-jordan-cremation In lieu of flowers, memorials can be made to CHKD, Norfolk, VA. Arrangements by Weymouth Funeral Home.